FREDERICKSBURG, Va. — Donald Trump is known for firing up crowds with ad-libbed speeches that frequently veer into offensive territory, but supporters at his rally Saturday sounded ready for a more buttoned-up candidate. Waiting for the Republican nominee to arrive outside Fredericksburg Expo Center, a number of attendees praised Trump’s speech in North Carolina this week in which he expressed "regret" for unspecified things he’d said that "may have caused personal pain." While the meaning was somewhat ambiguous, the shift in tone struck some as a step in the right direction. "It’s good he’s apologizing," Liam Daly, a local high school student voting in his first election, told NBC News. "He needs to act more compassionate, that’s what turns young folks away." Daly said he had his "fingers crossed" that Trump’s recent appearances would prove a model for the campaign. For Pete Foerster, a 49-year old cable engineer, the "regret" statement was "powerful" and overdue. Foerster is supporting Trump in the hopes he’ll shake up the "Capitol Hill club," but some of his more outrageous statements have bothered him. He cited Trump's disdain for refugees, with whom he sympathizes, and his offhand talk about potentially using nuclear weapons against the terror group ISIS as two issues that stuck out. "I wish he could filter better, but I believe in his message," Foerster said. While some were eager to describe Trump’s recent comments on regret as an apology, Drucillia Turner, 67, interpreted them as more limited in scope. "I think he’s regretful saying some things the way he said them," she said. "I don’t think retreat is his way." Inside the event space, Trump delivered his stump speech with the help of teleprompters, a practice he’s decried on the trail regularly throughout the last year. But the more scripted approach didn’t seem to dim the enthusiasm from the crowd, who punctuated his remarks with deafening chants of "lock her up! ", "build the wall!" and "tell the truth!" Nor was Trump's message drastically different — he questioned Hillary Clinton’s "strength and stamina," criticized free trade agreements, and promised to reopen coal mines in Virginia. "Our jobs are gone. Everything is gone," he said. "It’s going to change and it’s going to change fast." Trump’s campaign is in reboot mode this week following a staff shakeup and an uneven experiment with prepared speeches and it’s not entirely clear where things are heading. New campaign CEO Steve Bannon is known for spreading unrelenting and conspiracy-laden war on Trump’s enemies via his website Breitbart. And while Trump earned positive reviews for his message in Charlotte, he provoked a fierce response from critics over a speech on Friday in which he asked black voters “what the hell do you have to lose” by supporting him. He ditched that riff on Saturday, but asked "the African American community to honor me with their vote." Nonetheless, Trump’s fans are taking notice of the more controlled events of the last few days, with some volunteering that they were encouraged by his turn. "He’s doing well," Bill Ashton, a 23-year Navy veteran, said. 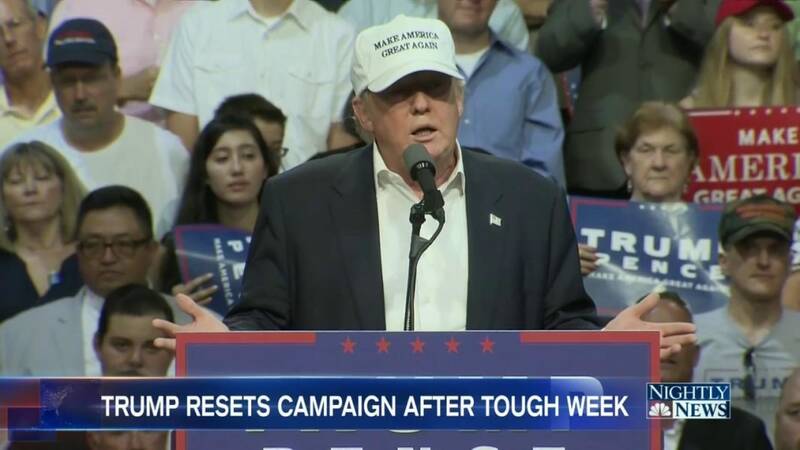 "The teleprompters keep him focused. If he stays focused, we’ll be winners." "I think he’s toned it down," Patricia Murray, a 61-year-old OB/GYN, said. "I think he’s reaching out. He’s being more thoughtful about what he says and how." Murray said she’s supporting Trump in the hopes he’ll cut down on regulations she felt were stifling her medical practice. "I vote on policy. I can overlook some of the statements he makes that might be offensive," she said. Teresa Pitner, 59, said Trump shouldn’t hesitate to lean on more seasoned advisers to determine his general election approach. "He’s like one of us; we’re not politicians," she said. "To get professional help is great." Whatever changes Trump makes in the final stretch, he has a long road to climb with voters outside his loyal base. 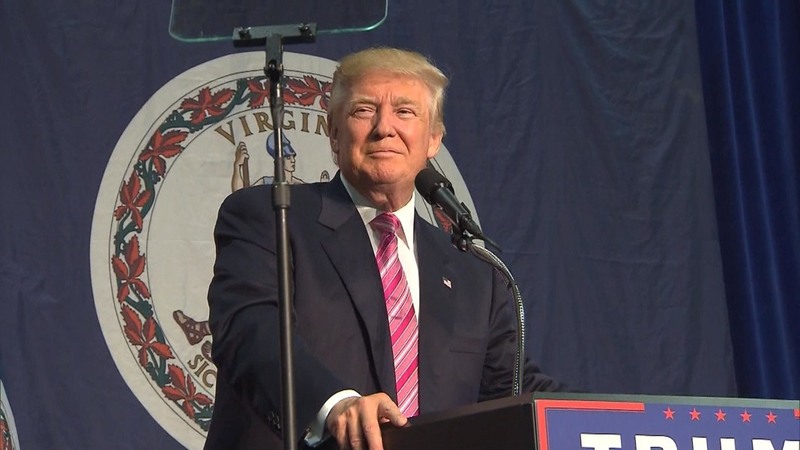 Several recent polls show Trump trailing Clinton by a double-digit margins in Virginia, where he’s especially unpopular with suburban voters in places like nearby Fairfax County.